My husband loves this cologne and has not been able to find it in stores. It smells masculine yet w a hint of baby powder. This is a great price so we got two for less than the price of one on other sites. Exude confidence with the poised and polished scent of this eau de toilette spray. This fragrance has hints of spicy sandalwood and aromatic cardamom, creating a warm yet seductive scent, perfect for a day at the office or a romantic dinner date. OMG, I have been missing out on an Incredible Scent! I love the smell of the Lacoste Pour Homme, Men's 3.3-ounce Cologne Spray. The scent lasts all day and into the evening. I appreciate the fact that there's no other cologne that smells like this. Lacoste hit a home run with this unique and elegant cologne. Have been using this for years. 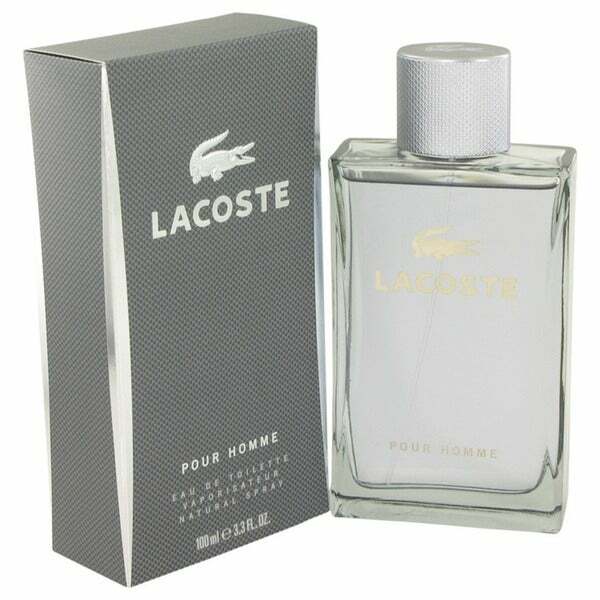 Lacoste Pour Homme Men's Spray is still great. Great product that is difficult to find. After searching in vain for this product in local stores, I was thrilled to find it at this site. It is a wonderful smelling cologne, and my son is always complimented on the fragrance that he is wearing. I received this product quickly and the ordering process was simple. First, ***, My pleasure -As Always! I first had gotten introduced to this fragrance about 5 years ago, and I fell in love! This is the first time I've once again owned this cologne, ever since that first bottle -5 years ago! ... It it just such a subtle, warm, welcoming -ISH scent, and I just cannot get enough of it! Thanks All! This stuff is great. I get compliments on the scent all the time. It is not overbearing and has a sweet tint to it. You could describe the scent as "soothing"
My husband has exclusively worn this cologne for many years now, so I've shopped around and this seems to be the best value for the price. I love the smell as well, a little bit sweet..but still manly way. Not too strong like some colognes. Will repurchase from Overstock again! Sophisticated cologne for a man. Great everyday fragrance. Bought this for our son. He really likes it. Very nice fragrance for men. Easy to shop Overstock. Thank you!!! Soft not too sweet! My boyfriend loves the scent . Overstock has the best deal for this item . I did my research and O wins! I was afraid that this might have been an old bottle but it wasn’t and smelled the same as what we buy at the department store. Thank you! Love the product and the speedy delivery! Best smelling cologne I have in my collection. Always a go to for me and the bottle is a nice big size that lasts a long time! Definitely worth it! "Is this authentic Lacoste Pour Homme cologne?" Hello Mojo, this is authentic Lacoste Pour cologne. Please let us know if you have additional questions. Thanks for shopping with us.